Not a new sheet, but one that has a couple of nice markings options. Both of these are in the light gull grey over white scheme with the upper color matte and the white gloss. 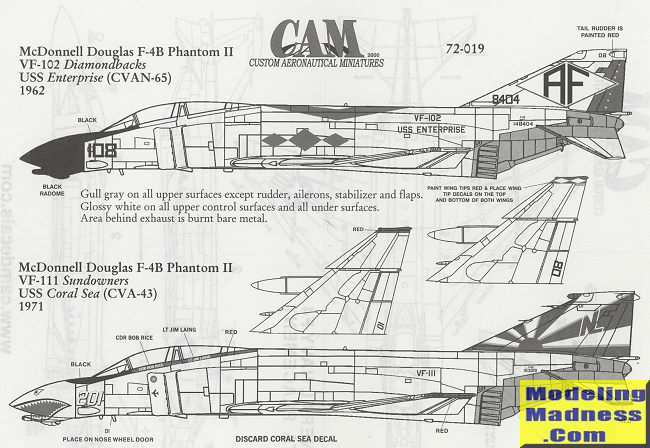 There is no kit recommended, but most modelers will go for the Hasegawa or the Fujimi kits. I'm not sure if Academy has done this version in 1/72 or not and I'm sure I've missed a few others. The VF-102 aircraft was aboard the USS Enterprise in 1962 for one of the earliest Phantom deployments. This one has a black radome and the modeler will need to paint the the red areas on the rudder and wing tips. The other is from VF-111 and this is a very popular squadron in terms of markings. 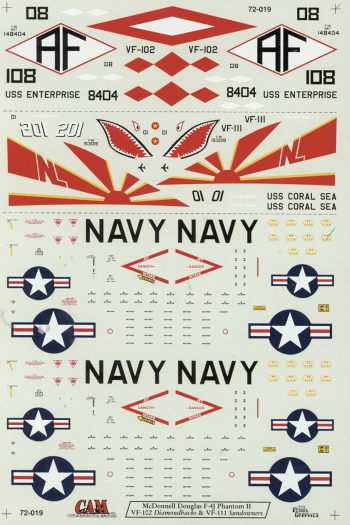 This particular set of markings is from the cruise aboard the USS Coral Sea in 1971. Note that the ship's name is not on this particular plane and it is a MiG killer. The canopy surround, wing tips and stabilizer tips are red. By providing just two options, CAM is able to offer full markings for both aircraft so no need to chose. You can do them both. A full data placement guide is provided on the reverse side of the instruction sheet.